We left the ACOE campground early, so we could find a parking spot in Blue Ridge for the train ride. We were expecting a bit of a walk to the train station in order to find a decent spot for the motorhome. As it turned out, we found one pretty close to the train. That meant we had some time for coffee before the big event. After meeting up with the rest of our group, we boarded the train for the ride to McCaysville, TN. Our grandson Aleister wore a special tag indicating that on the return trip he was going to be the junior engineer on the return leg. This got him a lot of attention for the train crew. They had him stand in the aisle of the rail-car and everyone onboard sang happy birthday to him. It was a bit hard to tell if he actually enjoyed it. The train traveled alongside the Toccoa River. 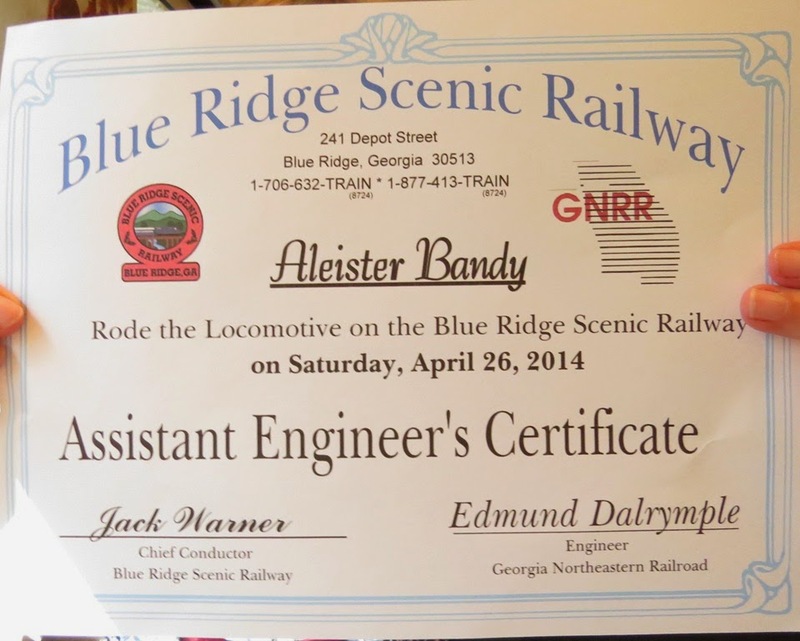 While not the most scenic train ride we have been on, it was a big hit with Aleister. On arrival, we had two hours to spend walking around McCaysville. I could not help but compare it to a cruise port. It seemed that the town was set up to primarily serve the regular arrival of train tourists. Also like cruise ships they made it very clear that you should not miss the return departure as there was no public transportation from town. Like the cruise ports, this day there was two trains in town at the same time. Another one parked nose to nose with ours and must have come from north TN. Walking around town we found the spot where you could stand in the middle of the bridge with one foot in TN and the other GA. There was also a nearby plaque that was a stark reminder of a time when the relationship between TN and GA was not very good. This was truly a border town between states, ideas and for several long years, enemies. Maybe that is why the drug store still sells guns. After leaving Alabama, we headed into the GA mountains area near Ellijay, so we would be able to join our grandson and family for his big birthday present. We are all going to take a train from Blue Ridge, GA across the border into TN. It is only an hour ride one way, but the big thrill is that he will get to ride one way on the engine. We had first planned on staying in a campground near Ellijay, but after pulling in and checking the place out, we quickly decided to find something else. 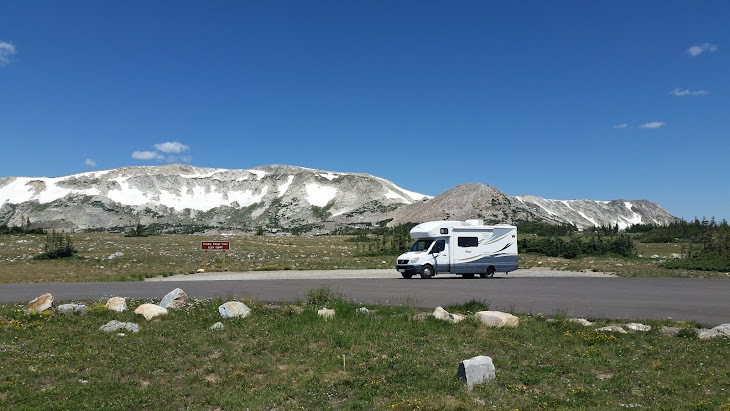 We ended up at the ACOE Carters Lake campground, which proved to be a beautiful location to spend some time. The lake is said to be the deepest in GA and is well known for fishing. There is great scenery and places to hike, but there is basically two directions in the campground area-straight up and straight down. We did manage to hike most of campground area with some heavy breathing. We are taking a short break from working on our pictures of the Panama Cruise to attend our grandson's birthday in Georgia. Our first stop along the way was the national exhibit site for the Tuskegee airman, as they are commonly known. They were the first African Americans to be trained as military pilots. They served in combat during WWII in Europe. All of the training was performed in Tuskegee, Alabama. We had tried to visit here last year but found the exhibit still under development. While not a large display, it does give you a feel for the conditions of the training and the difficulties the recruits experienced. While the display is small, there is a lot of history to absorb. Our second stop was in Cartagena. I doubt that if this port was not on a cruise ship schedule, that we would have ever thought to visit here on our own. We found that the city has a very long, fascinating and often very violent history. The first settlers appeared around 4000 BC. The first Europeans arrived in the 1500's. As we entered the harbor, you could begin the see the mix of the very old and very new city. Due to the perceived wealth of the area, many European groups tried to extract that wealth for themselves. The Spanish maintained control of the region for around 200 years. In order to defend the city, the castle San Felipe De Barajas Construido was constructed starting in 1657. The old city still has the intact outer walls. Our first stop was the fortress that sits on high ground protecting the city. You cannot help but be impressed with the sheer size of the structure and the labor that was involved with its construction. We arrived in the old city thru one of the numerous gates. First we walked the narrow streets and absorbed the old and new culture. There are many sections in the city that is home to nearly a million people. Our time was spent mostly in the historic part. The streets and squares show a glimpse of life in past centuries. A small church in ill repair house the remains and history of a Spanish Jesuit priest who arrived in Cartagena in 1610. Soon after his arrival, he began to minister to the 10, 000 slaves that arrived every year in the port. He devoted his entire life to working among the slaves. It is estimated that he baptized over 300,000 people personally. During his life, authorities tended to see him as a nuisance. However, after his death, it was realized how admired he was by much of the population, and he was given a state funeral. His remains are encased within the church altar. As a colony of the Spanish, Cartagena did not avoid the Inquisition which raged through Europe. It is generally accepted that the Spanish version of the Inquisition was the most severe. We visited the Palace of the Inquisition, which is on the site where the investigations took place beginning in 1610 and did not completely end until Cartagena declared independence. As in Europe, people were targeted because of their beliefs and in some cases because of the wealth they possessed. Before leaving, we made a quick stop at one of the tourist shopping areas in the old city. There is no doubt that these street vendors are among the most aggressive we have experienced anywhere. We did not have time to tour the new city, but the bus ride through that area confirmed what we were told about the huge amount and traffic and congestion that could last for hours.